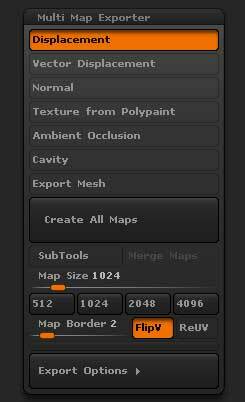 Multi Map Exporter is automatically installed with a standard installation of ZBrush. To install Multi Map Exporter, run the installer again. 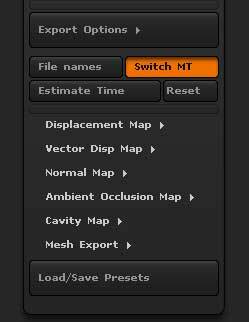 Choose which maps you wish to create and export from top five switches. The sixth option is for exporting an OBJ file of your mesh. Pressing the Create All Maps button will show a Save file dialog. Once you have chosen a location for the files the process will start. However, you will want to set various options first. SubTools: When switched on, maps will be exported for the visible subtools. If you want maps exported for all subtools make sure that they are all visible. The selected subtool is always treated as visible, whatever the state of its ‘eye’ icon. Merge Maps: If this is on, the exported maps will be merged into a single map for all subtools where the UVs occupy the same UV space. If different map sizes are used then only maps of the same size will be merged. ‘Merge Maps’ has no effect if the ‘SubTools’ button is off. Note: As you can see from the above image the man has three separate subtools (Eye, Teeth, and Body) that share the same UV space. 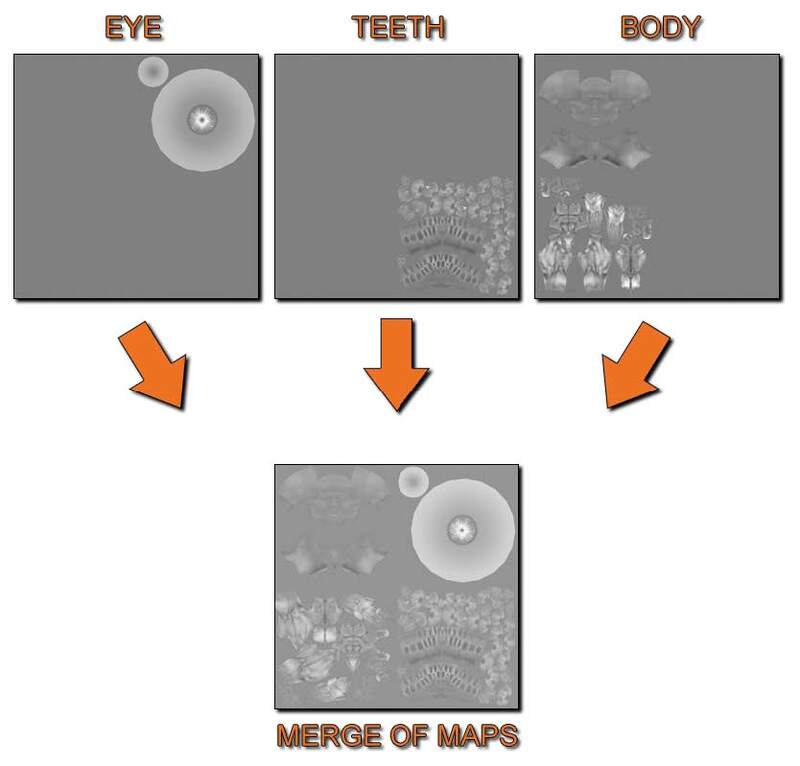 With Merge Maps on the Displacement Maps for the separate Subtools were merged into into one map due to all three Subtools sharing the same UV space. This can be done for all maps. Map Size: Sets the size of the map for all maps. Use the preset buttons underneath the slider to quickly set to the most common map sizes. The Map Size slider can be disabled by setting to zero. 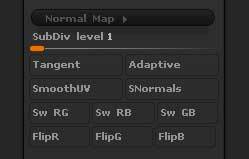 With a zero setting the Tool>UV Map>Map Size slider setting will be used as the map size for each separate subtool. So if you wish to vary the map size on a per-subtool basis set to zero. Map Border: Sets the overpaint border in pixels. Flip V: Flips all maps vertically on export. File names: This button enables you to set what file types to use for the different maps, whether existing files are overwritten and what suffixes to use for the different map types. File formats are divided into two groups; for 16 bit files and for 8 bit files. 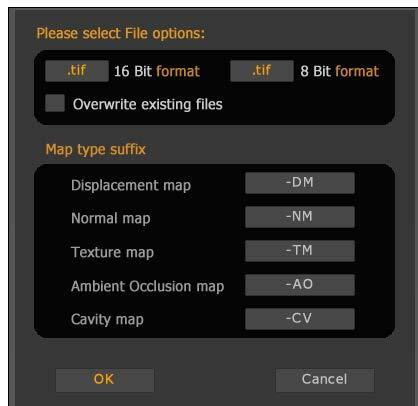 32 bit displacement maps are only exported as tif format. 16 bit files: These are grayscale and can be either tif or psd format. 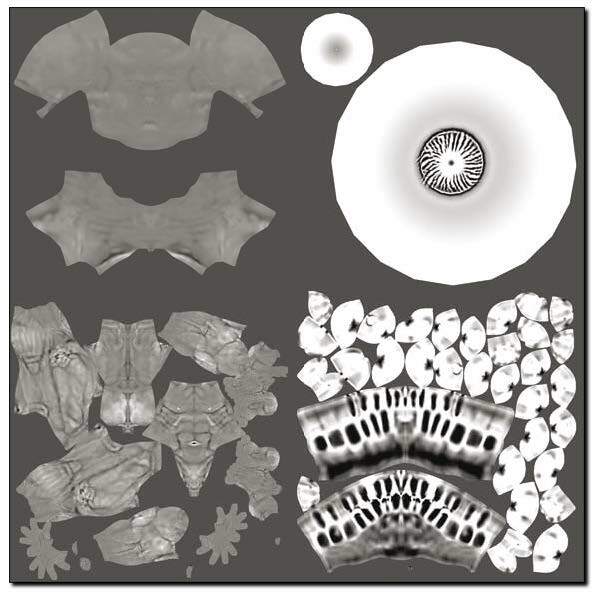 Displacement, Ambient Occlusion and Cavity maps can be exported as 16 bit files. 8 bit files: These are color and the available formats are tif, psd, bmp, tga and jpg. 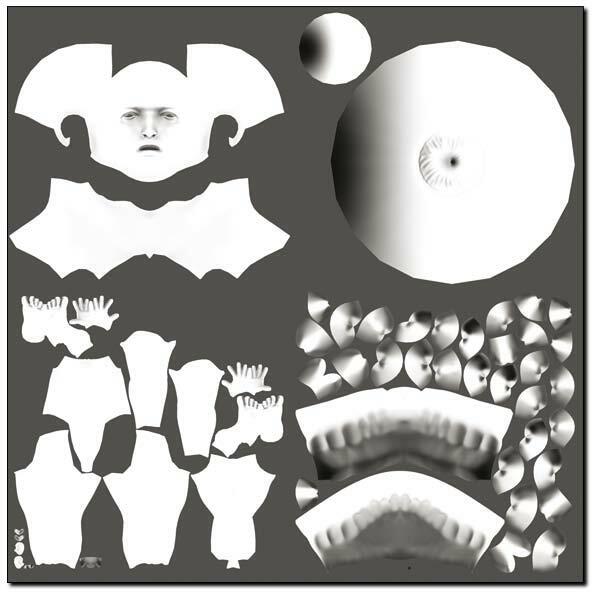 Normal, Texture from Polypaint, Ambient Occlusion and Cavity maps can be exported as 8 bit files. 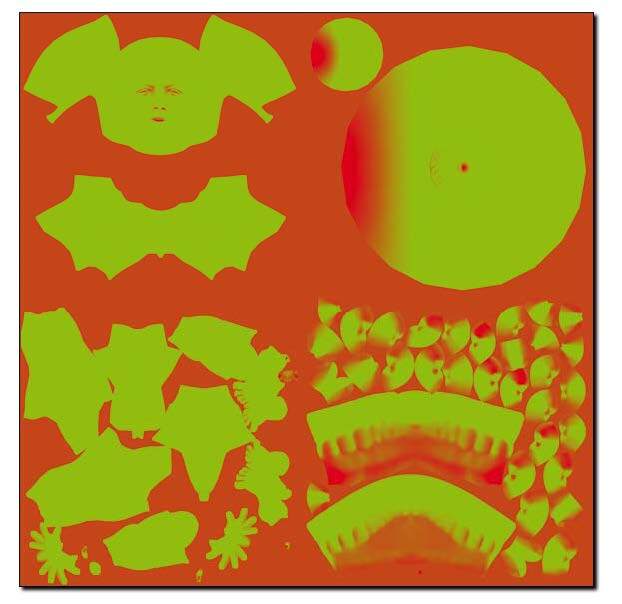 UV tile ID format gives several options to identify UV tiles. A UV tile is identified by the integer portions of its coordinates so that the UV tile [0,0]x(1,1) – that is U in the range 0-1 and V in the range 0-1 – has coordinates (0,0), the UV tile [1,0]x(2,1) has coordinates (1,0) and so on. <_uu_vv> 0-based coordinates. For example, the UV tile [0,0]x(1,1) would have _u0_v0 added to the file name. <_uU_vV> 1-based coordinates. For example, the UV tile [0,0]x(1,1) would have _u1_v1 added to the file name. <UDIM> Mari style numbering, so that the UV tile [0,0]x(1,1) is given the number 1001 which is added to the file name. Custom When selected, an X will appear to the right of the box. Click this to edit the format. Use $u and Sv to indicate the 0-based tile coordinates (or $U and SV for 1-based). For example, the UV tile [0,0]x(1,1) with a Custom style of –$U–$V– would have –1–1– added to the file name. OFF If you don’t use UV tiles you can turn off UV tile identification completely. If jpg is selected then a ‘quality’ setting will appear. For best quality select ‘100’, for smallest file size select ‘10’. Switch MT: This button only applies if you are using an original base mesh from another application and wish to generate maps for that. It assumes that you have stored a morph target before re-importing the original mesh. Displacement/Normal maps will be generated and then the plugin will switch the morph target before moving to a higher subdivision level for generating texture, ambient occlusion or cavity maps. Before starting the map export operation, each subtool must be at the subdivision level where the morph target is stored. Go to subdivision level 1. Store a Morph Target by pressing Tool >> Morph Target >> Store MT. Set the plugin options, making sure the ‘Switch MT’ button is on. Press ‘Create All Maps’ to start plugin operation. The Switch MT option has no effect if no morph target has been stored. Estimate Time: This button will give an estimate of the time the plugin operation will take for the current settings. SubDiv level: Sets the subdivision level from which displacement maps will be generated. If the slider value is greater than or equal to the highest subdivision level then level 1 will be used. DpSubPix: Displacement Map SubPixel Accuracy. The Tool will be subdivided “x” number of times that the slider states in memory before map creation. For example if there is a Tool with 1 Million polygons and then slider is set to 1 then ZBrush will subdivide the mesh one more time in memory before Displacment Map is created. Which would make the Tool 4 Million polygons before the map was created. Note: Remember that this does not actually subdivide your Tool to 4 Million it is only done when the Map is generated. Mid: The displacement mid value – for 16bit maps this normally set to 0.5; for 32 bit maps best results are with a setting of 0. 3Channels: 3 identical channels are included in the file, for those renderers that require an RGB format. 32Bit: Export a 32 bit Floating-Point map. When turned off the map will be 16 bit. exr: Turn on to export as EXR format. This over-rides the file names setting. Scale: This slider affects the scale of the map; higher values will exaggerate the displacement. For 32 bit maps the value should normally be 1. Intensity: The intensity or alpha depth factor that should be used when applying 16 bit maps. This value is set when the ‘Get Scale’ button is used. User input values will be added to the file names when the ‘16 Bit Scale’ option is used but the value has no effect on displacement map creation. 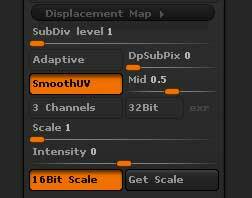 16Bit Scale: When switched on ZBrush will use the value set in the Scale slider when creating 16 bit displacement maps instead of optimizing each map on a per-subtool basis. This is useful when all maps need to be at the same intensity such as when the ‘Merge Maps’ option is selected. Get Scale: This button will estimate a suitable value for the Scale slider so as to give a 16 bit displacement map that is similar to an optimized version for the selected subtool. 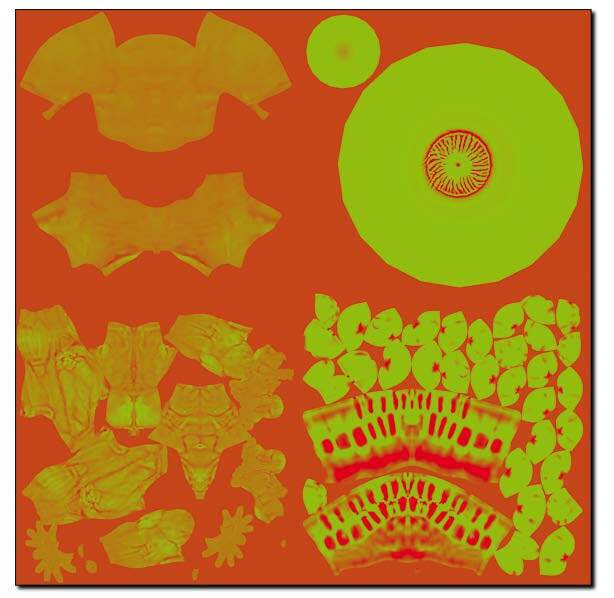 Different subtools can give widely varying results so it is important to assess which Scale value will produce the best results for your needs. In general the lower of a range of values should be used so as to avoid any clipping. SubDiv level: Subdivision level to generate map. vd Tangent: The vd Tangent option sets how the vector displacement map is computed – whether it’s based on the normal of the polygons or based on the world axis. With it turned on, ZBrush will create a Tangent map. Turned off will produce a World map. Because animated objects are in motion relative to the world coordinate system, Tangent mode must be used any time your model will be animated. World mode is suitable for static (non-animated) renders. 32Bit: The 32Bit mode defines the depth of the computed map and of course, its accuracy. With the vd 32Bit button activated, ZBrush will generate a 32-Bit map. With this button deactivated ZBrush will generate a 16-bit map. In this latter case it is important to note the alpha depth factor value which will be displayed at the top of the interface once the map has been created.The benefit of 32-bit maps is that you don’t need to set a depth value in your render engine to produce accurate results. Please refer to the 16-bit and 32-bit Vector Maps section above. exr: When pressed the vector displacement map will be exported as EXR file format. The settings in the file name dialog are over-ridden. vd SUV: When turned on, the vd SUV option smooths the model’s UVs when producing the displacement map. This option should be enabled if your rendering engine uses smoothed UVs. vd SNormals: Use Smoothed Normals. The vd SNormals option smooths the low resolution model’s surface normals and results in a smoother map. SubDiv level: Sets the subdivision level from which normal maps will be generated. If the slider value is greater than or equal to the highest subdivision level then level 1 will be used. Tangent: Create a normal map using Tangent(Local) Coordinates. Turn off for Global(World space) coordinates. SmoothUV: UVs are smoothed before the map is generated. FlipR: Flip the Red channel. FlipG: Flip the Green channel. FlipB: Flip the Blue channel. 16Bit: When on a 16 bit single channel grayscale file will be exported; when off the file will be 8 bit with 3 channels. Colors: When on, the Ambient Occlusion map will be generated using the main and secondary colors in the Color palette (only avaliable as an 8 bit file). Turn off for black and white. Cavity Blur: Higher Cavity Blur values will soften the cavity map effect. Cavity Int: Higher Cavity Intensity values give a harder edge and greater contrast. Negative values will give an inverted map. Use Curve All SubTools: The Cavity Curve for the current subtool will be used on all visible subtools. Only applies If the ‘SubTools’ option is on. 16Bit: When on a 16 bit single channel file will be exported; when off the file will be 8 bit with 3 channels. Colors: When on, the Cavity map will be generated using the main and secondary colors in the Color palette(only avaliable as an 8 bit file). Turn off for black and white. SubDiv level: Sets the subdivision level from which OBJ files will be exported. If the slider value is greater than the highest subdivision level then the highest level will be used. Quad: Polygons will be exported as quads (four-sided). Tri: Polygons will be exported as tris (three-sided). Flp: The polygon faces will be flipped on export. Mrg: UV coordinates will be merged on export. Grp: Polygroups will be exported. To load or save settings, press the Load/Save Presets button. All the plugin settings are saved, including the Cavity curve (if available). When loading presets a list of the last ten used files is loaded.